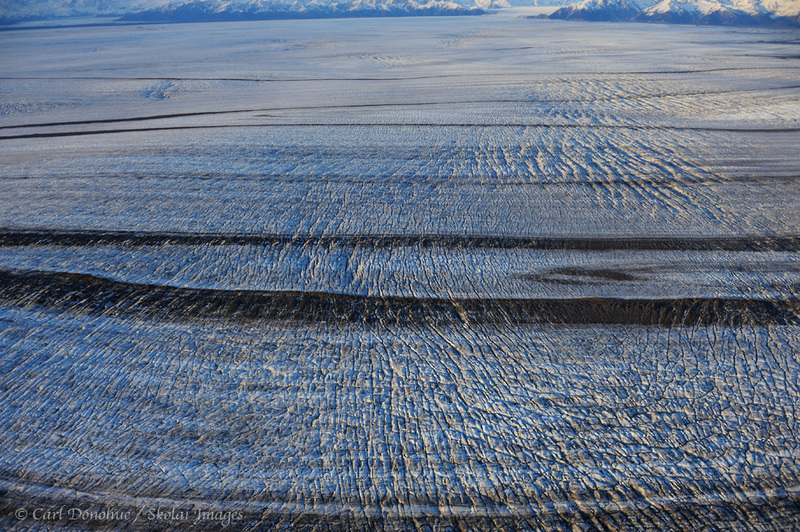 Malaspina Glacier at last light, showing medial moraines and expansive plateau of the glacier toward the Saint Elias Mount Range. Malspina Glacier, Wrangell - St. Elias National Park and Preserve, Alaska. Aerial photo. A look at the expansive Malaspina Glacier, sprawling across the coastal plain below the St. Elias Mountain Range to the Pacific Ocean. You can see many of the medial moraines banding across the ice. This minimalist image certainly emphasizes the vastness of the glacier. Question: Is the glacial flow top-bottom or left-right in the image? The glacier flow will ALWAYS align with the moraines; except for a terminal moraine, of course. So here the moraine bands indicate the glacial flow is across the frame, not top to bottom. I’ll post another image of this later and you can see some really cool moraine bands; they’ll confuse the answer even more. Stay tuned. Sweet image Carl. Don’t think I have ever seen anything quite like it. With just the sliver of mountain range, you get the feeling of this really massive expanse, so large it is almost hard to comtemplate, even with a photo right in front of you. Posted on Monday, November 14th, 2011. This epic photo was taken by Carl Donohue.